For Chemical or Agricultural applications – liquid or dry granular materials. Conical section has a 45 deg. slope for sediment settling or for more complete emptying. An 11 in. dia. 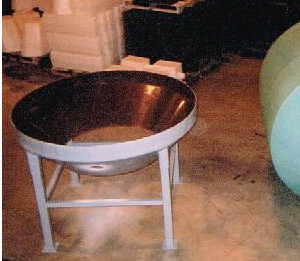 flat disc section at the base of the cone is for installation of a discharge fitting. Standard top access lid is nom. 16 in. dia. See Chemical Resistance Table in Down Load Section for chemical compatibility with polyethylene. A steel/fiberglass heavy duty stand with floor bolting plates is separately priced. The steel support frame comes primed or hot dipped galvanized.